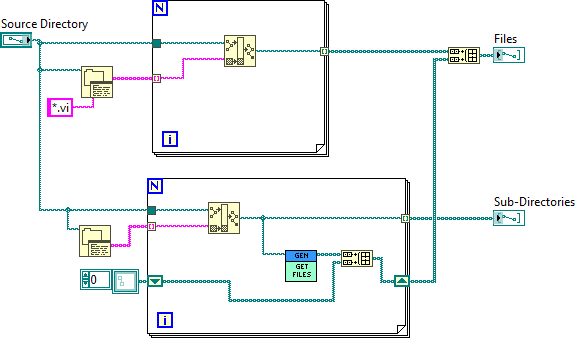 Screen Shot Generator for LabVIEW – FPGA Now! I finished writing an application that exercises the first Port of the 10 Gigabit Ethernet Interface that is provided with the National Instruments PXIe-6592R board and as I started taking manual screenshots via the LabVIEW “File->Print” option I began to ponder, can this be done more easily? Or dare I say it “programmatically”? I ended up finding a way to manually save a png file with the Front Panel and the Block Diagram of a VI. I then wrote a program that will recursively generate both a front panel and block diagram screenshot for each vi it encounters. This makes is easy for me to quickly create and update any vi images so that you can view the source code directly from github, without having to wait until you get home and open the code in LabVIEW.